We would like to wish a Happy New Year to all our customers and also to thank you for your custom throughout the year. It is getting on for a year now since we opened our little shop in February 2017. The shop has seen a few changes in that time. 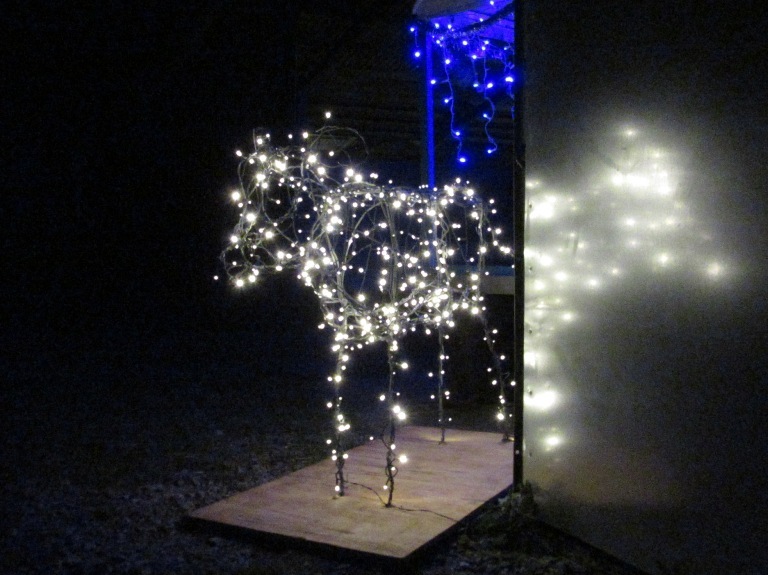 Over this, our first Christmas holiday it has looked nice and festive in its’ blue Christmas lights and John put lights on the wire calf that he has been working on. 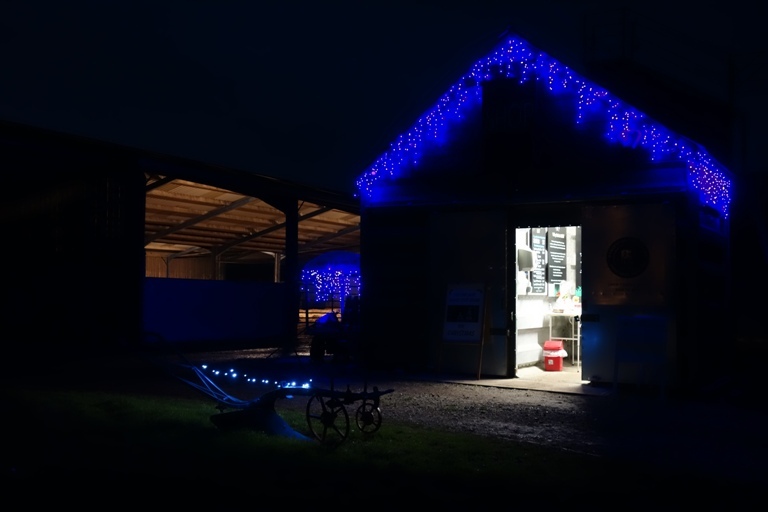 There were some sociable and busy days in the run up to Christmas as many of our customers collected their milk, cream and cheese for the holiday. 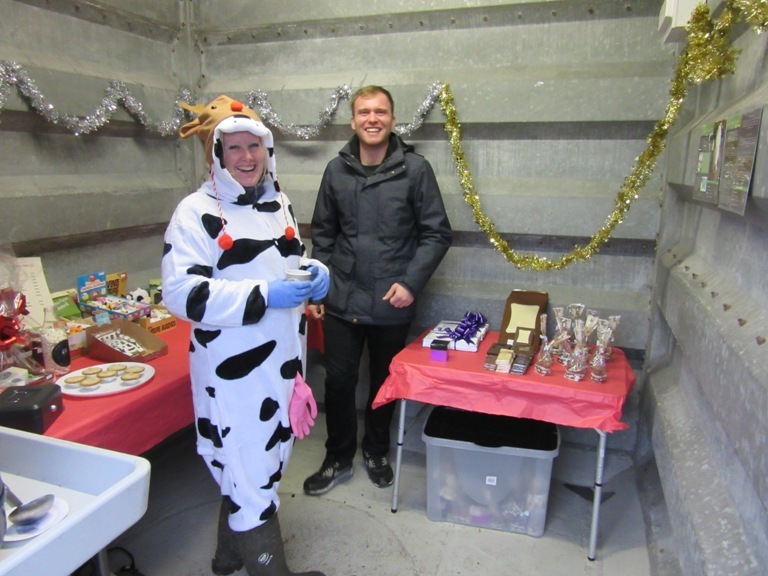 On Christmas Eve we had Leighton, who has recently set up My Choc O’Leight, selling his hand crafted chocolates as well as David from David’s Kitchen with his chutneys and chili sauces. Everyone seemed to enjoy themselves – particularly Lynnette in her slightly modified cow costume and there was quite a buzz about the place. 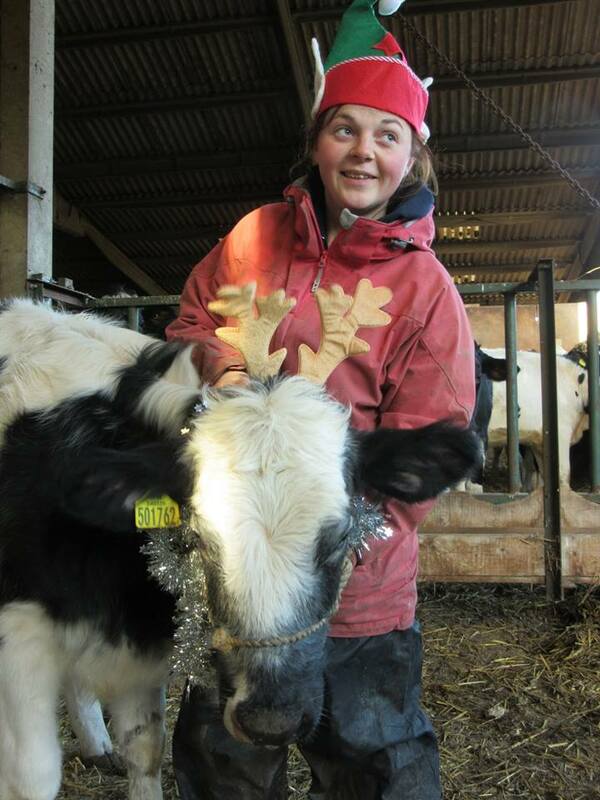 Another bit of fun was Chelsea posing with her favourite calf, Bertha, who had sprouted a pair of antlers just for Christmas. So thank you once again for supporting us. We hope that you have a Good New Year and look forward to seeing you in 2018. Duck Explosion at the Farm! As we cycled past noticing a sign we stopped and went and had a nosy. We left with some cheese but wanted to buy more but couldn't carry on our bikes. We have just moved down from London and loving all these treasures. The people showed us how to use the milk machine gave us tasters of the cheeses. They showed us around the farm well to where the cows were and gave us lots of info on how the milk is processed etc. So friendly and going back with friends on Friday. 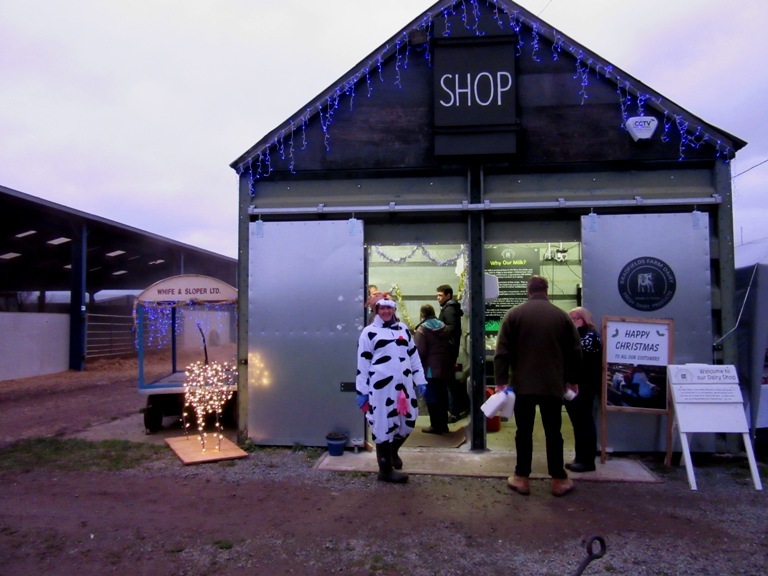 Visited today and purchased some cheese, cream and milk all of which tastes lovely. Hope this businesses is a success as it would be a shame to lose another local farm. Please visit and help support the local farming community. Well I think I was one of the first to buy milk from the state of the art vending machine and it was very easy and straightforward to use. The milk has a pure creamy taste! I feel very lucky to be able to have this facility in my neighbourhood! Very well done to all involved in getting this off the ground and providing us with this superior product! I'm looking forward to the cheese in the next few weeks !